With the rapid development of mobile computing and sensing technologies, huge amounts of data with location and time information, such as GPS trajectories of vehicles, real-time traffic statistics, and geo-tagged social media posts, have been collected. These data, commonly referred to as Spatio-Temporal Big Data (STBD), have the potential to transform the society but also pose significant research challenges for data mining due to high data-variety and large candidate pattern cardinality. This talk presents an example of STBD mining technique, namely, Urban Event Footprint Analytics (UEFA). UEFA is the process of detecting, characterizing, and forecasting the spatial coverage and time span of urban events such as gathering of crowds and traffic congestion. This problem is of great importance to a number of urban intelligence applications such as improving transport efficiency and mitigating public safety risks. In this talk I will present our work on two aspects of UEFA: (1) Early detection of gathering events, and (2) Forecasting gathering events through trajectory destination prediction. In the first problem, a novel Gathering Graph (G-Graph) is introduced to model the paths of gathering traffic in an event. A smartEdge algorithm is proposed to efficiently find the most "likely" G-Graph from urban traffic networks. In The second problem, a scalable trajectory destination prediction approach is proposed, based on which an online forecasting algorithm is designed to identify gathering events ahead of time. Case studies and simulations on real taxi GPS data as well as experiments on computational costs are also provided. Dr. Xun Zhou is an Assistant Professor in the Department of Management Sciences at the University of Iowa. He is also part of the University of Iowa Informatics Cluster. He received a PhD degree in Computer Science from the University of Minnesota, Twin Cities in 2014. Dr. Zhou’s research interests include big data management and analytics, spatial and spatio-temporal data mining, and Geographic Information Systems (GIS). His research has been recognized with best paper awards and an honorable mention from four conferences and workshops. 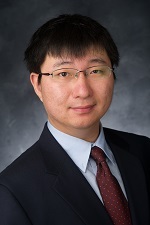 Dr. Zhou is a recipient of the NSF CRII Award (2016). He is a co-editor-in-chief of Springer’s Encyclopedia of GIS, 2nd Edition. Dr. Zhou serves as a poster co-chair of ACM SIGSPATIAL GIS 2017, a co-chair of SSTD 2017 Early Career Researcher Workshop, and a general co-chair of 1st ACM SIGSPATIAL Workshop on Analytics for Local Events and News (LENS’17). He also served on TPC of IEEE ICDM 2017, ACM CIKM 2017, ACM SIGSPATIAL GIS (2015-2016), as well as a number of workshops.